It is said that the only known way to keep children standing still is letting them move around. It looks paradoxical but it is true. Small children are really energetic fellows with ever excited minds. For this reason, they hardly stay in one place and will spend a great deal of time rolling around. 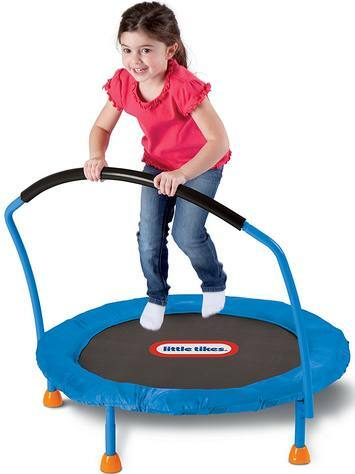 Little Tikes Trampoline is a terrific play tool for kids to burn their energy and help them stay upright. The soft covers, balance bar, and springs make Little Tikes Trampoline near risk-free. It is actually a family of trampolines with three members: Little Tikes 3' Trampoline, Little Tikes 7' Trampoline and Little Tikes 7' Climb ‘N Slide Trampoline. Here is a Little Tikes trampoline review covering the three main product lines of trampolines. I will recommend this trampoline for you if you wish to help your 3 to 6-year-old child stay active. Kids above that age bracket would be too heavy and may end up spoiling it in a shorter time while younger kids just aren't old enough to bounce on it. Little Tikes 3’ is the greatest energy burner member of the Little Tikes Trampoline family, thanks to its perfect size that offers hours of bouncing thrill. The safety bar can be folded down in flush with the top bounce surface for easy storage. For maximum fun, it can support a 1 kid at a time. The maximum weight is should be restricted below 55lbs top prevent the bounce surface from caving in. The manufacturer recommends indoor use to protect it from the weather beating. The plastic and metal construction helps boost its sturdiness. Clearly, the engineers at Little Tikes did a fantastic job. The trampoline comes pre-built; all you need is to unfold it. In addition to the No-slip rubber foot snap-on, its five legs flawlessly screw into the protected, painted and threaded lugs. The support bar is built onto the trampoline's legs complete with a padded crossbar w/ two screws. It takes 15 minutes to assemble this trampoline. I’m certain Little Tikes 7’ Trampoline was designed for preschoolers, toddlers, and elementary school kids. The large 7-foot, closed, bouncing area has just the right bouncing space. Finally, we have a bouncy, children trampoline that is both padded and durable. 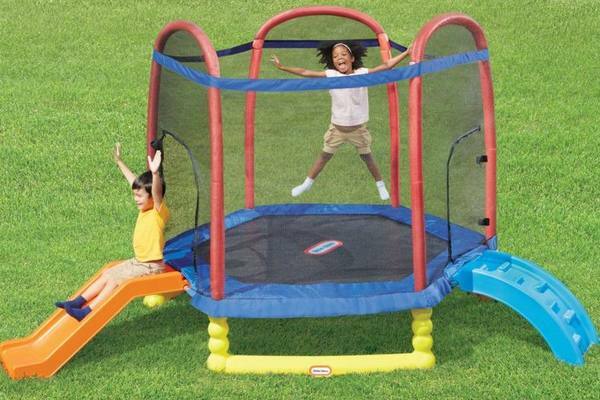 Little Tikes 7' Trampoline provides hours worth of active trampoline fun that will leave your child settled. 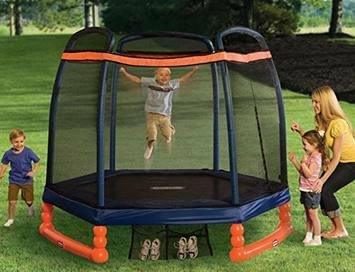 Little Tikes 7’ Trampoline features a durable, high-quality material pad protector that covers the safety springs that protects them from breakage and the child’s safety. The frame has a durable molded plastic construction from high-quality materials. The shoe holder is attached to the trampoline unit. The Jumping area has a measurement of 21.65 ft2. The total bouncing is diameter is 7 ft 4 inch (62.00"W) which is big enough to give one child a great bouncing experience. The ground to the jump surface height is 17.00"H. The net height is 46.00"H, most 10-year-olds can still fit inside with their highest jump. The safety enclosure/canopy is made of a PE netting and is supported by six heavy-duty steel poles. It is easier to assemble compared to Little Tikes 3 Trampoline. The high-quality pad protector cover on the safety springs prevents injury to kids. This trampoline is great for outdoor use. The netting on its six sides helps enclose children within confines of safety. When my son turned 5 years I decided to settle for a trampoline instead of taking him to the bouncy house. It turned out to be a great idea. It was sturdy and went together easily. Although the manufacturer recommends it to be set up by two people, I easily did it alone. I also found it to be highly portable, being able to be moved around the yard when it is already set up. My 5-year-old and his cousins couldn't get enough of it. They would climb in and out the trampoline for hours to a point I had to stop them to do other things (you know how too much play makes Jack a lazy boy). I was appalled at the installation part. We opened its box and my son started playing with the assembly pieces. While on the process of assembly, the instructions turned out to be quite easy to follow. About the time I was finishing the installation my jovial son was already bouncing on it, elated. I just finished the whole process by adjusting the zipper and let him have fun. I’ve never impressed him before. 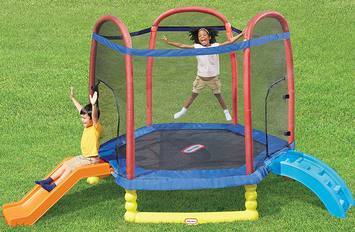 Little Tikes 7' Climb 'N Slide Trampoline comes with two zipper enclosures which help promote safe play. The durable, top-quality pad protectors and the accompanying springs make enhances the bouncing capability making even more fun to play on. All exposed metal parts of this trampoline are covered with safety foam covers to help reduce chances of your children sustaining injuries. The supporting frame is durable, thanks to its blow-molded plastic construction. Since this trampoline is made for outdoor use only, the blow-molded plastic construction guards it against corrosion when it is left out overnight. The inclusion of both climbing and slide steps gives children one way of getting on the trampoline and one way of sliding out of it, with the two being designed around convenience. This trampoline can support a maximum weight 105lbs. Only one child can bounce on it at a time. Since it comes in smaller individual pieces, it requires assembly, a process that will take 15 minutes to complete. However, only the steps and the slide can be disassembled. The net and the enclosure largely remains intact with which is both a bliss and a boon. It is made for outdoor use but you need to keep it covered when it is not in use. Each Trampoline in the Little Tikes Trampoline group has its own weight limit. 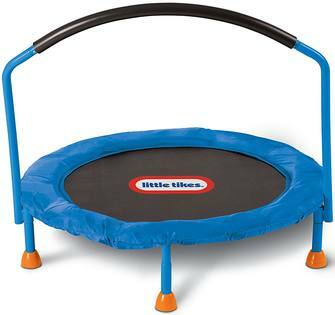 Little Tikes 3' Trampoline can comfortably support weight not exceeding 55lbs at a particular time. Most 3 to 6-year-olds lie in this weight category. 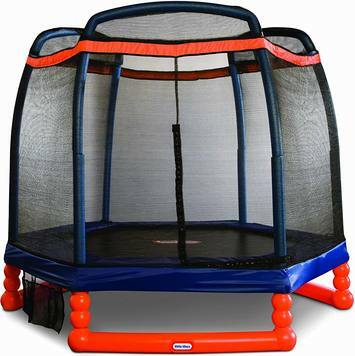 Little Tikes 7' Trampoline can support weights amounting to a maximum of 100 pounds which lies in right weight margins of most 3 - 10-year-olds. Little Tikes 7' Climb 'N Slide Trampoline has the capability to withstand a maximum of 105lbs. In terms of weight, this trampoline can support most 10-year-olds who are slightly heavier to not to use the Little Tikes 7 Trampoline. From the manufacturer's specifications, Little Tikes Trampolines are made for children aged 3 to 10 years. A 2 year your old will be too young to be seen on any trampoline. I can't imagine a 12-year-old trying to bounce on such a tiny trampoline. Little Tike Trampoline is a predominantly outdoor kids’ leisure tool. It is too big to be used indoors. Another reason why this trampoline is recommended for outdoor use is the fact it is considered safer for children to slide down onto grass than concrete. Little Tikes is a US-based company that majors in the manufacture of children's toys. It was established in 1968 and has its head office in Hudson, Ohio. Their products are mainly low-tech molded toys for young children and infants. The company has a reputation for supplying durable plastic toys just complex enough to push kids into using their imaginations while playing and solving problems. Its best selling toy is the yellow "Cozy Coupe" which has sold 6 million units world since its introduction in 1979. A short dig into the history of the company reveals that it was founded by Thomas G. Murdough on 10th November 1969. He sold it to Rubbermaid in 1984. In 1991, he founded another company, Next 2, to compete with his old firm. Little Tikes trampolines are some of the most sought-after trampolines due to the high-quality material used to make them. The steel frames make Little Tikes Company’s Trampolines last longer than most industry competitors. Every trampoline made by Little Tikes Company has a warranty of 1 year. It is only valid if the trampolines have been handled and maintained according to the manufacturer’s instructions. As a result, the company doesn’t cover accident, abuse, scratches from normal wear, abuse and other defects not associated with the company’s workmanship. There are only two remedies under the warranty: product replacement or replacement of the trampoline’s defective parts. The price tag of the product is within affordability range of most new parents. The most expensive trampoline in this line (Little Tikes 7' Trampoline) goes at $300. This doesn’t look much if you consider the convenience of the trampoline. ​The trampoline puts to use elastic webbings, not springs. I think the elastic webbing is the most appropriate of all accessible options because it is more long-lasting than the often used bungee cord and a lot safer compared to springs. At the start, the bounce feels a little firm but in the long run, it appears to gradually loosen up. ​The big safety bar is a great idea and having it on the whole surface keeps kids safe at all times. It is very helpful since my son often swings on the trampoline with his several cousins. Perfect Size configuration - This trampoline’s jumping surface is just the correct size for children’s feet. It isn’t too big to overwhelm their small feet and it isn’t too small to feel insufficient. The foam around this trampoline’s handle tends to crack too soon – When my son hasn’t bitten it off, it unreasonably wears off on its own. This means I have to keep lining the steel bars with my improvised home foams. For some people, this trampoline can turn out to be a little hard to assemble together unless you take some time to read the diagram carefully to know the direction you need to turn the trampoline’s bar. ​The legs seem not to be on the level, so I had to place one of the feet under a rug or a tiny block of wood to prevent it from rocking side to side. An improvement would involve adding a leveling adjustment under the legs. ​Also, the added orange stoppers keep weakening and falling off when I attempt to move the trampoline around the house. But this is not a big deal. ​I wish it could fold up entirely for storage. It doesn’t. ​I dislike the fact that I have to closely watch the trampoline every second to ensure it doesn’t tip over. ​The more the kids get daring, the more likely the trampoline will flip. One child can hang on its bar, and it immediately starts to tilt. But I think that’s just the normal of the game. 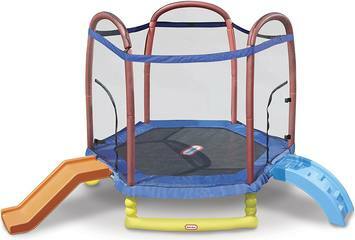 Owing to the popularity of Little Tikes Trampolines, you can buy their trampolines from a range of online outlets. It is prudent to buy them from Amazon. The three most often featured trampolines on Amazon are Little Tikes 3’, Little Tikes 7’ and Little Tikes 7’ Climb N’ Slide Trampolines. As any Little Tikes trampoline review will tell you, not every trampoline is great for your children. For this reason, I recommend you to visit the store with a list of specifications. The weight limit of the trampoline matters a lot. Take the weight limit and compare it to your child’s weight. A good trampoline for kids needs to have handlebars to support them when climbing onto the trampoline. Also, it should possess maximum safety features. Depending on the state of your purse, the price tag of the trampoline is directly influenced by the surface area of the mat.